If required Hervey Bay airport transfers - $23 per person return. Prices shown are Per Person and valid until 31st July 2016. Why not combine your 2-Day Fraser Island Cool Dingo Tour with an extra night before and after the tour to connect with your flights (flights not included). After each full-day tour, you'll return to the wilderness lodges for a refreshing shower, great buffet dinner, some Dingo Bar fun and a comfy night's sleep. You'll wake to bird song and a hearty buffet breakfast which will get you ready for the day's adventures. If you're catching a plane around 12.30 from the Fraser Coast, we'd advise you catch the 7.50 ferry transfer just to be doubly sure you make it on time. Foreign Language Guides are now available on our Cool Dingo Tours. Please ask when booking or talk to your tour guide. Make sure you check in at the Kingfisher Bay Mainland Terminal (at River Heads) at least 30 minutes before departure. After a 50 minute cruise to Fraser Island, arrive at Kingfisher Bay Resort to check in to your Wilderness Lodge accommodation and meet like-minded travellers from all over the world. Relax, chat with new friends, or head to the Jetty Hut for a cool beverage and a mango coloured sunset over water (island's are the only place you can experience this on the east coast)... or explore the resort and go for a swim. Today we check out some of Fraser Island's coolest inland sights. Basin Lake - first stop is a walk to beautiful Basin Lake along sand tracks - get up close and personal with the resident freshwater turtles in this gorgeous little dune lake. Wanggoolba Creek - walk along the banks of this silent flowing creek with lush green rainforest and rare king ferns... it's Mother Nature at her best! Pile Valley - check out the towering, red satinay trees in this rich sub-tropical forest... real giants! Lake McKenzie - with its white sandy beaches and crystal clear waters, picture perfect Lake McKenzie is even prettier than the postcards. Enjoy a refreshing afternoon swim before heading back to Kingfisher Bay. An early start to explore Seventy-Five Mile Beach, the world's most amazing beach highway. Eli Creek - a great spot for a refreshing dip on a warm Queensland day! Float down this fast-flowing freshwater creek - which pours out 80 megalitres of water daily - to the seaside. Maheno Shipwreck - washed ashore during a cyclone in 1935, this rusting wreck is one of Fraser's most iconic photo stops. The Pinnacles Coloured Sands - With all the colours of the rainbow (well just the reds really) these vibrant sand cliffs are another favourite photo stop. Indian Head - climb to the top of this rocky headland for awesome beach and ocean views... look out for sharks, rays and migrating humpback whales (Jul - Nov). 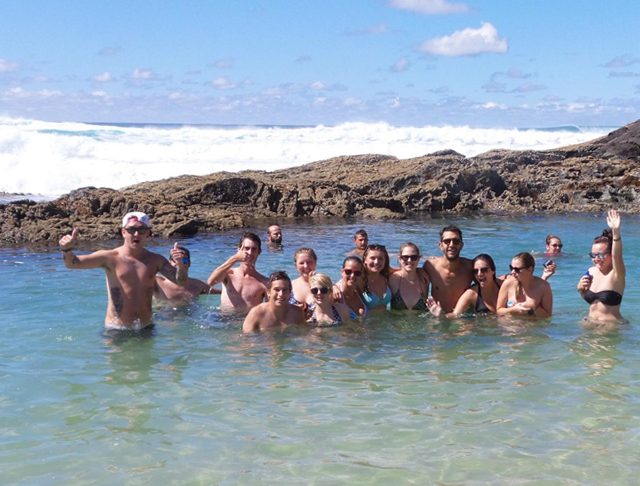 Champagne Pools - chill out in these bubbling ocean rock pools, you won't want to leave! DAY 4: DO WHAT YOU WANT BABY! Includes buffet breakfast. Please note - touring order and itinerary may vary due to tides, seasons and weather conditions. 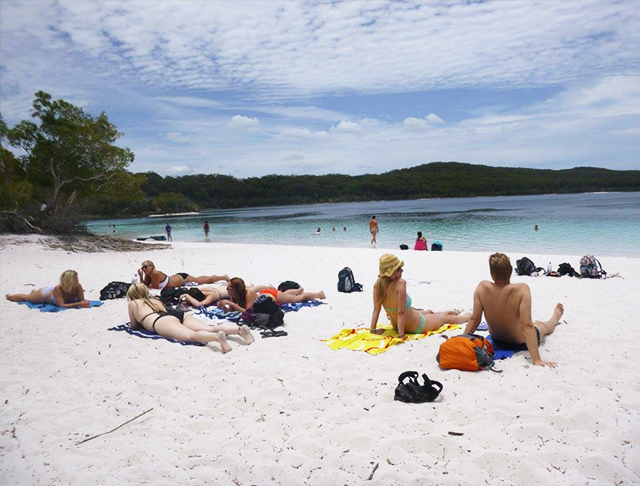 Your guide is a Fraser Island expert and is passionate about the island. You'll be whisked off over sand tracks to explore some of the island's most beautiful, natural spots - but they'll also wow you with fascinating facts about the island's history, fauna and flora. Keep an eye out for dingoes, plus we have more than 354 species of birds, and migrating humpback whales can often be seen off the eastern beach from July to November! On a Cool Dingo tour, your guide guarantees a fun and entertaining time...or the cool dingo eats his hat! You'll need to have a day-pack ready (with everything you'll need for the day's touring) before you check in at the Kingfisher Bay Mainland Terminal, as your tour starts as soon as you arrive on Fraser Island. Your main backpack or other luggage will be delivered to the Wilderness Lodge storage area for you to collect in the afternoon. Don't forget to pack your swimmers, towel, hat, sunscreen, insect repellent, comfortable walking shoes or sandals, sunglasses, essential medication and your camera. Water will be provided, but a water bottle is always handy. If you find this deal cheaper anywhere - we'll beat it baby! 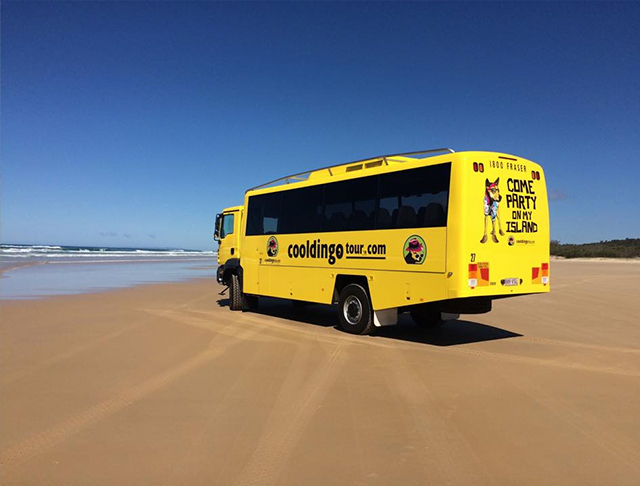 Do Fraser Island in style - book your Tour and Accommodation with Johnny Feelgood...the adventure dudes!